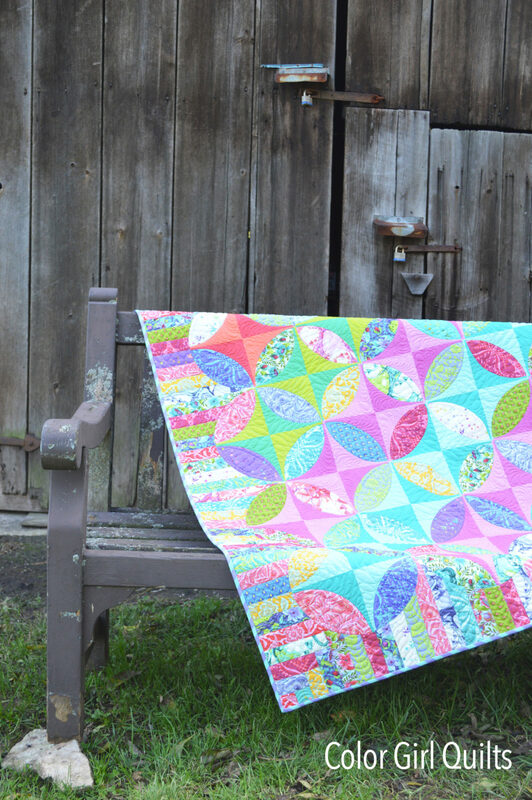 Any Tula Pink fans in the house? 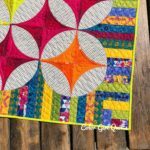 I have enjoyed many of her fabric collections, but my favorites are the ones that really show off her talent for clear, vibrant colors in off-beat combinations. She is one designer that shows incredible illustration and design skills with highly detailed fabrics featuring whimsical and intricately drawn creatures, flowers and geometric patterns. So, if these are the things that make Tula so well-loved among sewists, then she has hit a home run with her next collection, Pinkerville. 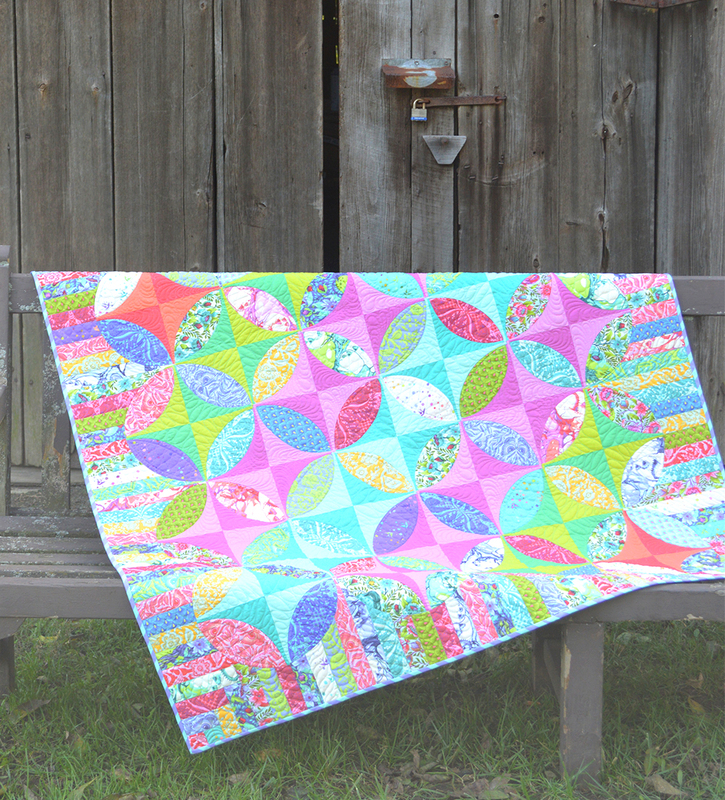 I was super excited (and really surprised) when the marketing person from Free Spirit Fabrics asked me to sew a quilt with the new Pinkerville collection for them to display at Quilt Market a couple weeks ago. 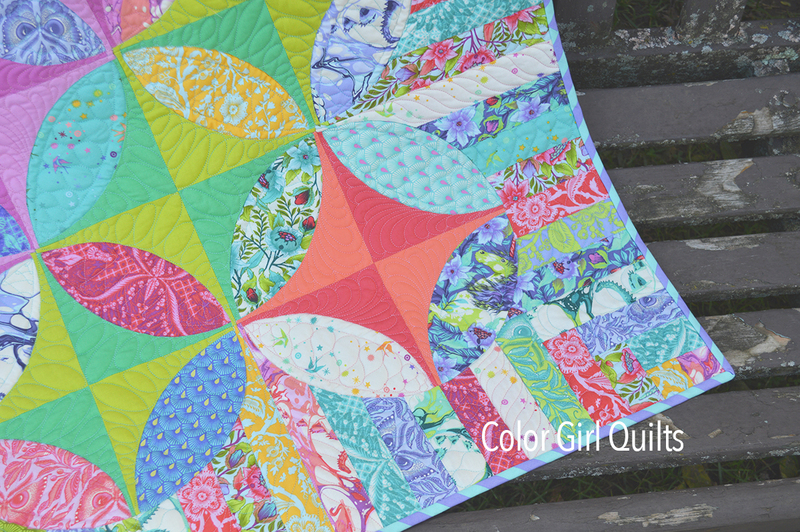 Quilt Market is the trade show for quilting/sewing industry people to share their new products twice a year. My first impulse was to make my newest pattern, Radiance, hoping to show the prints at their best in an eye-catching design. 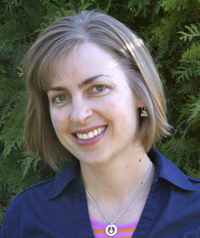 Pinkerville is all about Tula’s imaginary world. It’s filled with swans, unicorns, butterflies and even a sea creature. Blender prints include a gorgeous fairy dust print, which is probably my favorite! I love how the collection features bright cheerful colors, but is also very soothing: aqua blues and lime green, soft lavender, shades of pink and a pop of yellow all come together perfectly. I decided to make this version of Radiance with a different color/print layout from the original. 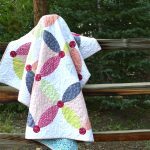 Instead of using a light fabric for the orange peel shapes and putting the emphasis on the pieced border, the Pinkerville quilt features the prints throughout. This created a bit more challenge in planning to make sure there was good enough contrast in each block between the solid color and the print in the orange peel. It also meant that there is less contrast between the orange peel shapes and the pieced border. The overall feel is softer, but I think is just perfect for the fabrics and colors, what do you think? 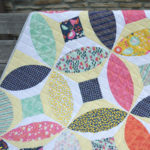 Radiance patterns are available here on the website (also a kit for the original quilt, here). Pinkerville fabrics release in March 2019. 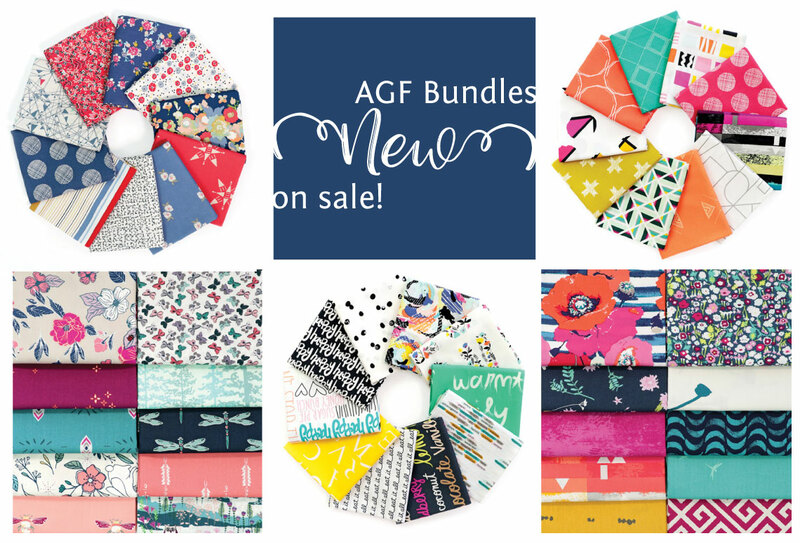 I have fat quarter bundles available to pre-order, Here. You can get Radiance, or any pdf pattern of your choice FREE with a Pinkerville bundle pre-order by putting both the Pinkerville fabric bundle and your chosen pattern in your cart and using coupon, “tula”, at checkout. Love this version of Radiance!